Today I want to do an update on the area I call the kitchen garden. I call it that because it’s close to the house and with easy access to the kitchen. The beds around the greenhouse give us about 100 sq.ft. of growing space, and are mostly protected by cold frames. Right now I have four cold frames in use, but I plan on adding a fifth one soon. I use the cold frames year round to protect things from the hungry hordes of deer that roam freely around here. I number the cold frame beds for my own reference so I can rotate the plantings from year to year. Cold frame bed#1 is in need of replacement, but is holding together for the moment. 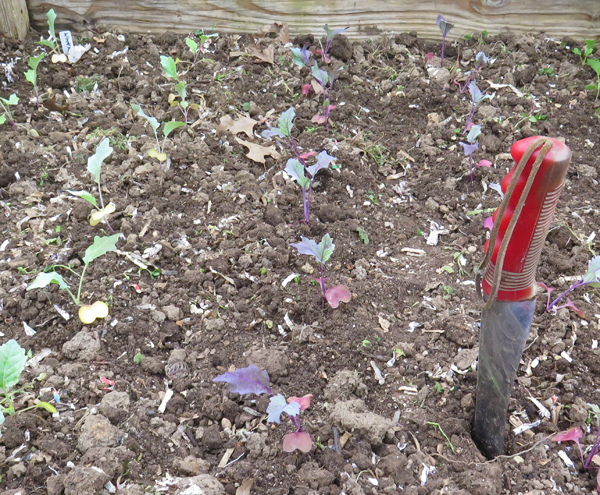 I planted it with kohlrabi about two weeks ago. I have a mix of Winner, Kolibri and Konan planted in there, for a total of 35 plants. They have grown only a little since they were planted, but they are looking good and should take off growing once the weather settles down and gets warmer. I need to mulch in there but I have held off until the soil warms up a bit, as any mulch will surely keep the soil cool. Bed #2 has a little bit of overwintered Viroflay spinach in it as well as new plantings I made in the last few days. I have 2016 AAS winners Katarina cabbage and Prizm kale planted, plus Tokyo Bekana loose headed Napa cabbage, Mei Qing pac choi and Yukina Savoy tatsoi. This is a new cold frame I just assembled about two weeks ago with a slightly different design, and I will do an update on it soon when I finish the second one I am working on. I only replaced the bottom part since the cover from the old one was still usable. Bed #3 was planted about a month ago with transplants of Red Tinged Winter, Jester, Simpson Elite and Red Sails lettuce. Like the kohlrabi, they are growing slowly. They joined the overwintered White Russian kale that I planted last fall, and three Winter Marvel lettuce plants that survived the winter and are now starting to size up finally. There’s also some Ethiopian Highland Kale planted in there, hiding next to the White Russian kale. Bed #4 is currently empty. I just pulled the overwintered spinach that was bolting, and I plan on replanting soon with more lettuce and a bit of arugula that is waiting in the wings. I haven’t harvested any of the White Russian kale yet. I still have plenty of kale in the greenhouse, and I will use it up first. You can see in the above photo that the kale is quickly outgrowing the cold frame, and that is one thing I intend to improve on with the new ones I am building. I need to make them a bit taller for things like kale and kohlrabi. Right next to cold frame #1 is a bed that is now planted with green garlic. That’s where I plan on putting the fifth cold frame. About the only thing the deer don’t eat around here are garlic and onions, but everything else is fair game. I will plant the rest of this bed once I get the new cold frame in place. It looks like I need to do a little weeding and mulching in there too! Next door to that bed I have onions and carrots planted. I have cut way back on my plantings of both these veggies this year after last year’s dismal performance. I planted Mokum and Purple Haze carrots ten days ago, and they haven’t started sprouting yet. I have them covered with Agribon material to keep the soil moist until they are up. I’m growing Candy, Super Star and Red of Tropea this year with plants I got from Dixondale Farms. 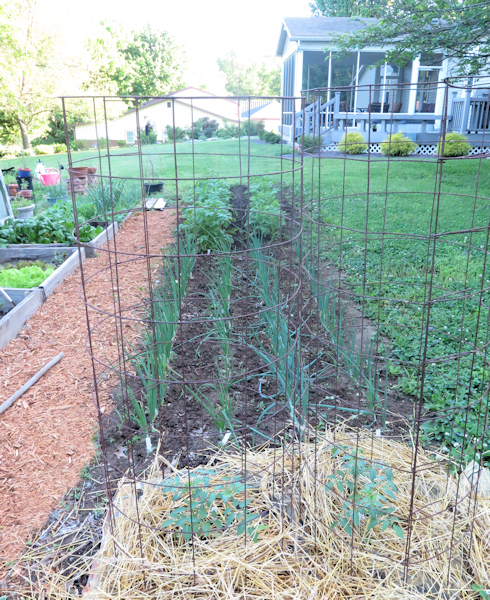 The onions are looking pretty good, and I have more planted in containers for scallions. I’m not quite ready to give up growing onions here but I am getting close. The plants are definitely not paying for themselves, though that’s not the only reason I garden for sure. I also have a 4 ft by 30 ft bed adjacent to the cold frames that I planted with onions and potatoes last year. This year I plan on planting ‘overflow’ tomatoes in there. I have 18 tomato plants growing that are unnamed and unreleased varieties I got as part of my Artisan Seeds Collaborating Membership. I plan on growing some of these in the main garden area, but there won’t be room for all of them. I received one packet of seeds from Fred Hempel that is breeding stock material, and I will grow those plants out and look for any tomatoes that I think have exceptional flavor. If I find one, I will save seeds and send them back to him. Of course I plan on eating as many of these tomatoes as I can too! I hope you have enjoyed this look at how the kitchen garden is doing in early April. I plan to do another update in about a month, when things are hopefully further along and ready to harvest. This entry was posted in Gardening and tagged Artisan Seeds, carrots, cold frame, kale, kitchen garden, kohlrabi, lettuce, onions, spinach, tomatoes. Bookmark the permalink. Sounds like the trouble you have with deer is like that which I have with badgers! I’m looking forward to seeing how you get on with the trial tomato varieties. That seems like a really interesting scheme you are in. And jealous of that nice thick planting of spinach – mine is just sitting there and I’m hoping it doesn’t go from zero to bolt once the weather warms up. Can I ask what your cold frames are topped with? Glass, plastic? If you use the cold frames year round to protect from deer nibbles, they must get awfully hot with a cover on? They’re covered with Agribon row cover material. In summer I usually take the Agribon off and use a mesh bird netting on the covers. I gave up on the intermediate day onions from Dixondale, 2 of the 3 varieties are too prone to bolting and I don’t want to grow just the Red Candy Apple, so I’ve got 7 new varieties that I started from seed. Fingers crossed that they will be tolerant of the weather fluctuations here. The sow bugs are really bad in the greenhouse. I do trap them under boards but they seem to multiply faster than I can dispatch them! So it’s Sluggo Plus to the rescue.